British-Pakistani boxer Amir Khan has made a name for himself on the sporting stage as one of the most talented athletes out of Britain. Amir Khan is your Connector of the Day. 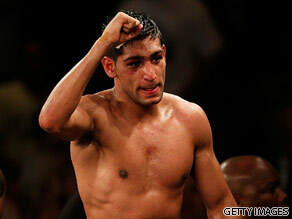 At the young age of 22, Khan became the fourth youngest world champion in the "WBA World light welterweight" division. Khan also became the youngest Briton to win a boxing medal during the 2004 Athens Olympics when he was only 17 years old. Born in Bolton, England, Khan started boxing at an early age and quickly found his feet in the sport. Khan went on to win several junior boxing titles including a gold medal at the 2003 junior Olympics, gold at European Student Championships and gold at the world junior lightweight title. Today, Khan is the world welterweight champion. Here's your chance to quiz famed boxed Amir Khan. Do you want to know how he is reacting to news of the devastating floods in Pakistan? Do you want to know if he has any big fights coming up? Here's your chance to quiz Amir Khan. Leave your questions below and be sure to include where you're writing from. Its nice to see u and altogether pakistans name in positive. As part of our young pakistanis We feel proud for u. I have one question to u: now that u are in lime light so in what way u may help ur fellow countrymen in this testing times when 3/4 of pakistan is flooded and when very little help is coming from the world. Amir I think your next fight should be against d- alexander ..Your speed and power plus the straight two hand guard . Very smooth. Let's do it again at MSG ..
We are all very proud of you Amir. It's great to see that you still associate yourself and are proud of your Pakistani heritage. We all need to put in an extra effort for the flood victims in Pakistan. Being a Pakistani heritage and making headlines in the area of sports, do you think that you can change the bad image of Pakistan has? Amir, i have been following your progress since 2005 and i must say you are a fighter in every sence. both in real life and on the ring. i like the way u are always proud of Bolton and ignoring the fact that u are from parkistan. please try and use your influence in the parkistany community to educate them to desist from acts of terror and rather channel their fustration, if there is any, to hard work and love for all humany like u do. terrorism affects every one not only the west and every body has a problem in one way or the other. Who do you think will win if Manny vs Floyd happens ? I love watching your fight against Paulie Malignaggi. Do you expect to fight in the more often States? – What is your opinion on the way David William Donald Cameron, the current Prime Minister of the United Kingdom, is Improving the Health, Safety and Well-being of ALL Boxer? – What is your opinion on the way Asif Ali Zardari, the President of Pakistan, is organizing Unity, Discipline and Faith(اتحاد، تنظيم، يقين مُحکم) in Pakistan? –	What is your opinion on the way Human Flesh Cloning and Robot Machinery are Improving the Health for ALL Paralyzed Boxer People? I am awaiting Amir Iqbal Khan’s replies. I'd like to know, why choose a sport in which people get to hit you repeatedly? I understand all about competition & preparation, but I wouldn't put myself in that position. What is the ultimate thrill this sport provides for you? Has the sport of boxing changed over the years in terms of safeguards to avoid brain injuries, etc? If so, what safeguards are in place? Being a Pakistani I am so proud of you and thank you for raising Pakistan's name on world stage. Do you have friends or relatives in Pakistan and do you believe that talented Pakistanis like you are improving Pakistan's image? Im very proud of you to be muslim from pakistan that must be gwet and i suport both economic and moraly. I really admi u khan n i hope this will serve as a yardstick to tell ma fellow muslims dat thers a chance for every one to develop.islam is not about terrorism so we shouldn,t support it. what inspires you everyday when you wake up? Men i m a nigerian, but proud of u though,let joint hand tightly n fight against terrorist n stop killin of innocent soul around d globe. You are one of my favorite boxers. Who do you think is the best boxer of all time and the best active boxer? I feel very happy and excited o see a young man of his age been a welterweight champion.It's call for a celebration,i appreciate him. What advice would you give to amateur boxers? You have said that you want to fight Juan Manuel Marquez in December however Marquez is a small lightweight who can still make the superfeatherweight limit . He is also 37 years old while you are young and are a big jr welterweight and can easily go up a weightclass or two . I know marquez is a big name and you have said that he is better than the other top fighters at Jr Welterweight but above lightweight (as we have seen in the Mayweather Jr – Marquez fight) Marquez was slow , lethargic and not in trim shape . This is why many boxing fans don't want to see this match up. My point is don't you think you would be better served to fight your mandatory challenger Marcos Maidana ? He is widely seen to be a bigger threat than Marquez who at this stage in his career is not the same fighter he once was . I beleive you can beat Maidana and you would get plenty of respect for the win whereas a Marquez win won't and you will be crtitcised .